A fairly self-explanatory place name, Hammersmith, a district located in London’s west, records the fact there was once a blacksmith’s forge here. 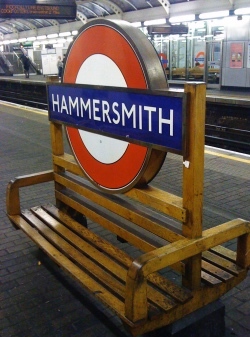 The name, which also refers to the westernmost of London’s inner boroughs – since 1979 under the combined name of Hammersmith and Fulham, derives from two Anglo-Saxon words and dates back to at least the 13th century. The village of Hammersmith sprang up along the major roads leading out of London and its roads, including some of the busiest in the city, still dominate the area’s landscape. There’s been a chapel of ease in the village of Hammersmith since the early 1660s but in 1834 it became the parish church. The current Grade II-listed church, St Paul’s Hammersmith, dates from 1883 and contains some monuments from the original building. 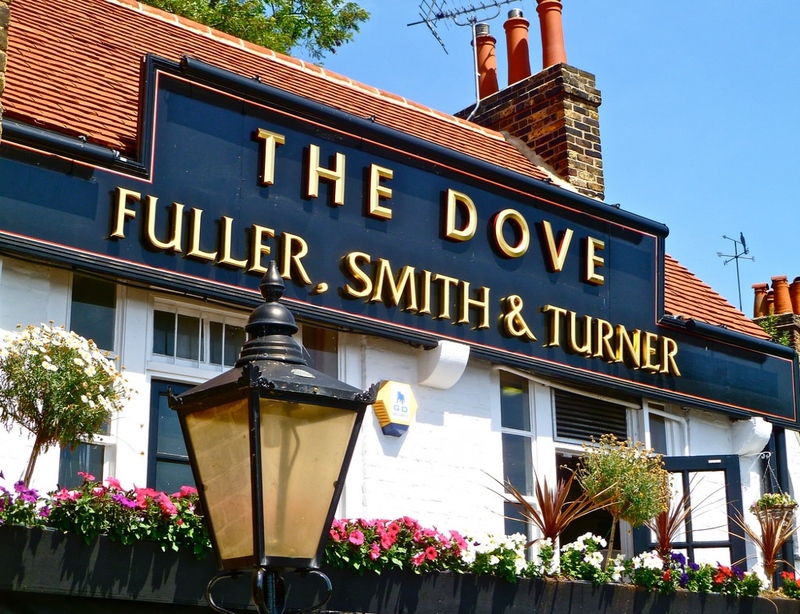 Other significant sites in Hammersmith include St Peter’s Church which, built in 1829, is now the oldest church, the Lyric Theatre which has origins going back to the 1880s, and, The Dove, which was listed by Guinness World Records as having the smallest bar in the world. Hammersmith Bridge, which runs across the River Thames to Barnes, is a Grade II* suspension bridge designed by the civil engineer Joseph Bazalgette and opened in 1887. It replaced an earlier bridge designed by William Tierney Clark and opened in 1827 (it was the first suspension bridge across the Thames). 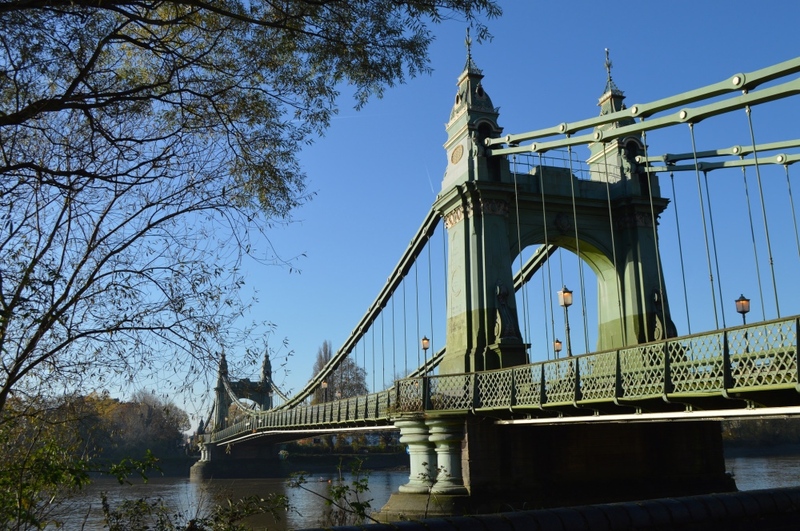 PICTURES: Above – Hammersmith Bridge (Matt Brown – licensed under CC BY 2.0); Hammersmith Underground Station (Peter Gasston – licensed under CC BY-ND-NC 2.0); The Dove (Herry Lawford – licensed under CC BY 2.0). Sure, it’s quite obvious that this well-known thoroughfare through Chelsea and Fulham in west London was named for a king but which king and why? It was the Stuart king Charles II who first starting using the road’s course as part of his route to Hampton Court which meant it was closed to the public. Access was granted only to those whom the monarch permitted – initially via ticket and from the 1720s via a copper pass stamped with the king’s monogram. Entry was controlled by a series of gates located along its length. King George III was also known to use the route to travel to his palace at Kew and it was only in 1830 that it was finally opened to the public. 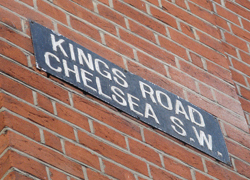 The road, which now runs west from Sloane Square for two miles through Chelsea, transforming into the New King’s Road after entering Fulham, is now known for its shopping (not to mention the site of the UK’s first Starbucks in 1999) although in the 1960s and 1970s it served as something of a hub for London’s counter-culture. The road has been associated with many famous figures over the years – the king aside. Composer Thomas Arne lived at number 215 and apparently composed Rule Britannia while he did, actress Ellen Terry lived in the same property from 1904-1920 and bon vivant Peter Ustinov after her. Other famous associations include one with Mary Quant, who opened her ground-breaking boutique Bazaar at number 138a in 1955 and Thomas Crapper, toilet entrepreneur, who had a premises at number 120. This south-west London Thames-side district (and the bridge named after it), traces the origin of its name back to Saxon times. Recorded in the Domesday Book as Putelei and known in the Middle Ages as Puttenhuthe, it apparently goes back to a Saxon named Puttan who lived in the area and the Old English word ‘hyp’, which means ‘landing place’. Hence, “Puttan’s landing place” (or Puttan’s wharf). Putney has something of a storied history – it was the birthplace of Tudor heavyweight Thomas Cromwell, Georgian-era author Edward Gibbon and it was here, in the still-standing parish church of St Mary the Virgin (pictured), that the Putney Debates were held in 1647 among members of the New Model Army. The first bridge was apparently built here in the first half of the 18th century and the present stone bridge in the 1880s. 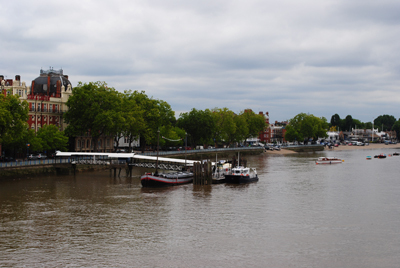 Today a sought-after riverside residential district, Putney boasts a sizeable high street, great riverside pubs and eateries and is particularly popular every April when The Boat Race is held between Oxford and Cambridge universities thanks to the starting point being just upstream of Putney Bridge. The area also is home to the 400 acre Putney Heath (which adjoins Wimbledon Common), a popular site for duels in the 18th century, and also home to a stone and brick obelisk, erected in 1770 to mark the 110th anniversary of the Great Fire of London (more on that in an upcoming post). This Thameside area in London’s west has a long and storied history and its name is a reflection of it. Long home to the ‘country’ manor of the bishops of London (Fulham Palace, pictured above), the name Fulanham is recorded as early as the late 7th century. While there’s been speculation in the past that the name Fulham (also recorded among other variations as Fullam) was a corruption of ‘fowl-ham’ – relating to the wild fowl that were to be found here – or of ‘foul-ham’, relating to the muddied waters, that’s now apparently generally deemed not to be the case. Instead, its name most likely owes its origins to an Anglo-Saxon named Fulla and the Old English word ‘hamm’ – a term for a water meadow or piece of land enclosed in a bend in a river (in contrast to the more common ‘ham’ which refers to an estate or homestead) – and referred to the manor he owned here, its boundaries set by a bend in the Thames. (It should be noted there is evidence of earlier occupation of the site by the Romans and as far back as the Neolithic era). In about 700, the manor of Fulham – which includes the area we now think of as Fulham as well as land stretching as far afield as Acton, Ealing and Finchley – was acquired by Bishop Waldhere of London from Bishop Tyrhtilus of Hereford. 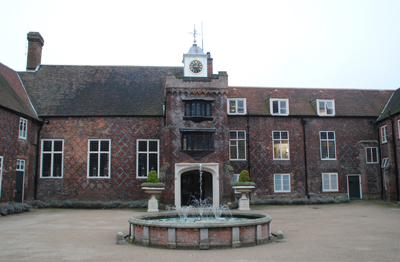 Since Tudor times, Fulham Palace was used as the country home of the bishops of London and in the 20th century became their principal residence. 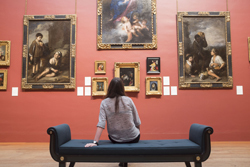 It was used as such until 1975 and now houses a museum and reception rooms. As well as now being used for the area which once contained what became the village of Fulham itself, since 1979 the name has also been used in that of the Borough of Hammersmith and Fulham. Interestingly, Fulham Broadway tube station was known as Walham Green when it first opened in 1880 and was only given its current name in 1952. The bishop’s palace (and the nearby riverside Bishop’s Park) aside, other landmarks in the area include the Grade I-listed All Saints Church, which is largely late Victorian and which hosts the grave of abolitionist Granville Sharp, and the nearby Powell Almhouses which date from 1869. 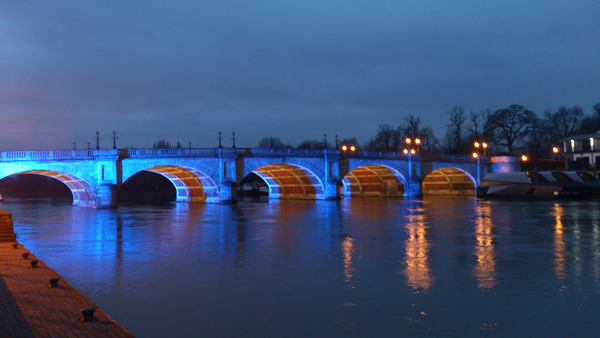 It’s also linked by Putney Bridge with Putney on the other side of the Thames; the current bridge is the work of Sir Joseph Bazalgette and was built in 1882 – it replaced an earlier wooden bridge built in 1729 and overlooks where the annual Oxford-Cambridge Boat Race begins (other bridges spanning the river from Fulham include the rather ugly Wandsworth Bridge). Known during the 18th century as something of a mecca for gambling, prostitution and other debauched leisure activities, these days Fulham is known for its football club, Fulham FC headquartered at Craven Cottage stadium (named for a cottage owned by Baron Craven which once stood here), shopping and is a sought-after residential location. Taken an interesting photograph of somewhere in London? We’re always looking for interesting images of the city so if you’ve got one you reckon captures a snippet of life in London, please contact us at exploringlondon@gmail.com or via Flickr at www.flickr.com/groups/exploringlondon/. Now officially known as the BNY Mellon Boat Race, the annual rowing event between Oxford and Cambridge universities was first held at Henley on Thames in 1829, moving to London for the second event in 1836 and becoming an annual event (with the exception of the two world wars) in 1856. One of the most controversial races ever held – and next year’s will be the 159th – was in 1877 when the race, run over a four mile, 374 yard course which starts in Putney in west London and taking in a great bend of The Thames as it goes past Chiswick and Hammersmith, finishes at Mortlake, ended in a “dead heat”. The drama began as the boats passed Barnes Bridge, about three-and-a-half miles through the course, when one of the blades of the Oxford team’s oars broke after striking rough water. Oxford (wearing dark blue) had been leading the race and the incident is believed to have helped Cambridge (wearing light blue) to draw level – so much so that both crews are recorded as having passed the finish line in 24 minutes and eight seconds. It’s the only time the race has ever finished in a draw and there was, as might be expected, significant controversy over the result. With no finishing posts then in place, the judge, a waterman from Fulham named ‘Honest John’ Phelps, had to decide the result from his place in a small skiff on the water (and, according to the official Boat Race website, it is believed he was in a position to do so and not dozing under a bush as others have suggested). His skiff, it is believed, may have drifted off the finish line. In addition, it was not the only craft on the water and it’s believed that the other craft filled with people eager to see the result, may have partially obscured his view. Even if they hadn’t, his was a tough task. Oxford, however, thought they had won by a matter of several feet and it’s believed that as a result Honest John announced the result as “dead heat to Oxford by five feet”. The result was later confirmed as simply a “dead heat”. The controversy did lead to some changes – including the introduction of finishing posts – a stone on the south bank and a post on the north – and the passing of the role of judge to members of the two universities instead of a professional waterman. Following this year’s race (also rather controversial – see our earlier article here) Cambridge has 81 wins and Oxford 76. For more on the history of the Boat Race see our earlier entry here or visit www.theboatrace.org.